Crazy is maybe the right way to describe me - in more aspects than just quilting. I have the "pack-rat" syndrome when it comes to fabric, trims, laces, buttons, clips, and what-nots. I collect and collect. 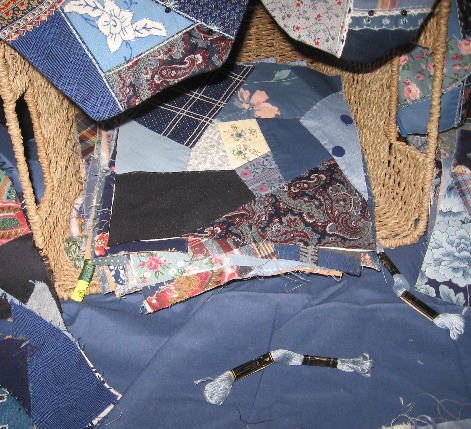 Even the smallest little piece can be usable in a crazy quilt, not much gets thrown-out. I just love to create. Crazy quilting is that great free-form cloth art that can bring out the artist in anyone. 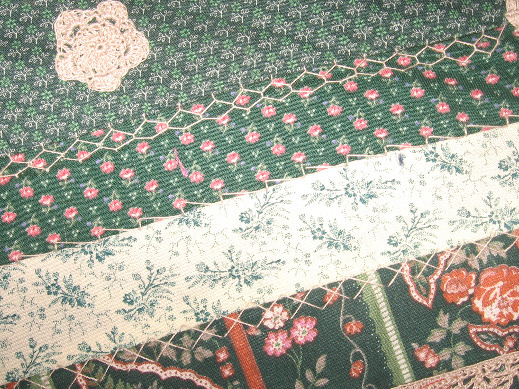 Whether you'd like to follow the original styles of the Victorian era with lots and lots of embellishments or the more frugal, utilitarian approach of the pioneers (now mostly referred to as "Country").Crazy quilting lends itself equally to the novice with very basic sewing skills or to the experienced quilter who just needs that little push to lose the limitations of structure, that goes along with the building of a traditional quilt. I've been teaching quilting classes at my sewing shop for the last twenty years and found that the best way is to jump in, with two feet first. 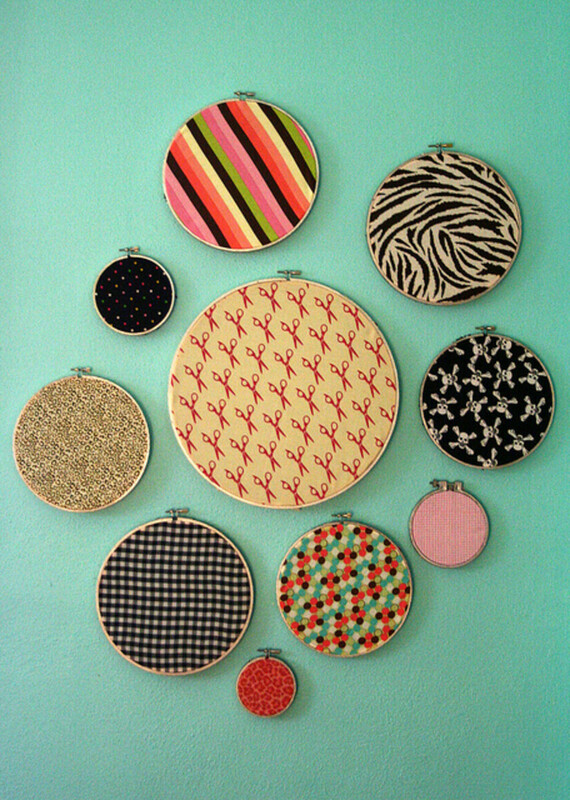 Small projects, such as a Christmas stocking, small evening bag, vest, or wall hanging is an inexpensive way to learn the skills required for crazy quilting. Depending on the amount of embroidery and bead-work one plans to use, it's also fairly fast to accomplish. It always amazes me, that with the same instructions and methodology each of my students can come up with totally different looks. Everyone's minds eye and ear sees and hears something totally different in the instructions. Some use many colors and shades in the really vibrant hues, others the more delicate pastels. My absolute favorite is the monochromatic, where the textures of the fabrics do the actual talking. 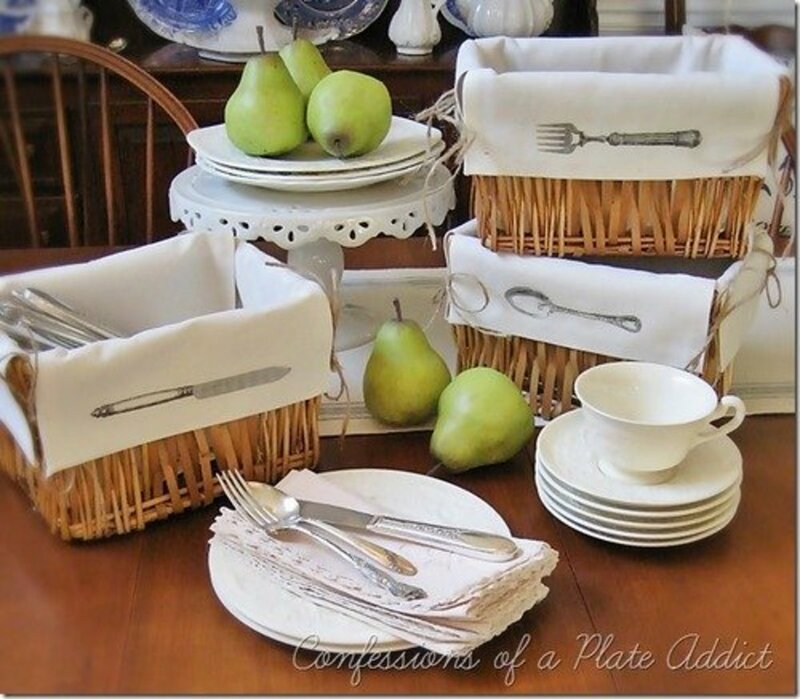 For example join together a piece of even-weave raw silk, a chunk of satin, damask, some hand woven fine wool, all in a similar shade of cream, white, black or ?, then embroidered with a variety of stitches using a rayon thread, the results can be striking. Naturally your collection of textured fabric in one particular color has to be extensive. After a while your eyes will seek out all the beautiful weaving styles in the fabrics available at the store. However ones you've been bitten with the crazy quilting bug beware, even someone walking by with the right colored or shaded jacket or scarf etc. will tempt you to pull out scissors. Just a small piece, please. (Let me tell you it can be quite embarrassing when you're caught starring at the blouse of the bank teller, desperately tempted to cut out a chunk because it would fit just right...., but that's a different story). I'm sooo involved in this hobby. 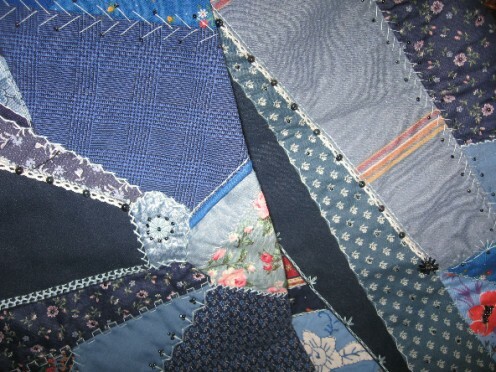 I could go on and on, I just love crazy quilting, no better yet I'm "crazy about crazy quilting"
A quick note coming from experience, Crazy Quilted items are best Dry Cleaned and not washed. 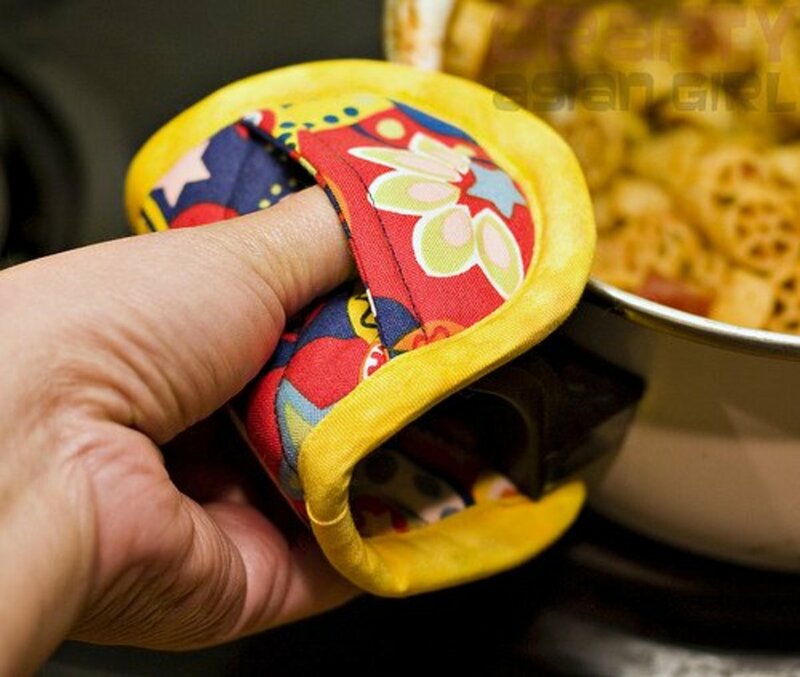 All the different types of fabrics could act differently. 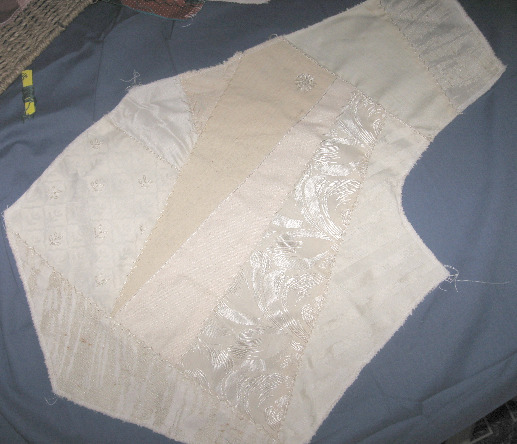 (one shrink... the other not etc) After all the work that gets put into a crazy quilt it would be a shame for it to get messed up by washing it. Moral Ethics. Don't feel bad , just think of how great you feel once you've got your quilt finished. Yarntales! Mistycyn! I will put my 10 step into a Hub soon. Promise. My stain glass quilt I started as a newbie for the first quilt ever has been ongoing for the past 15 years. 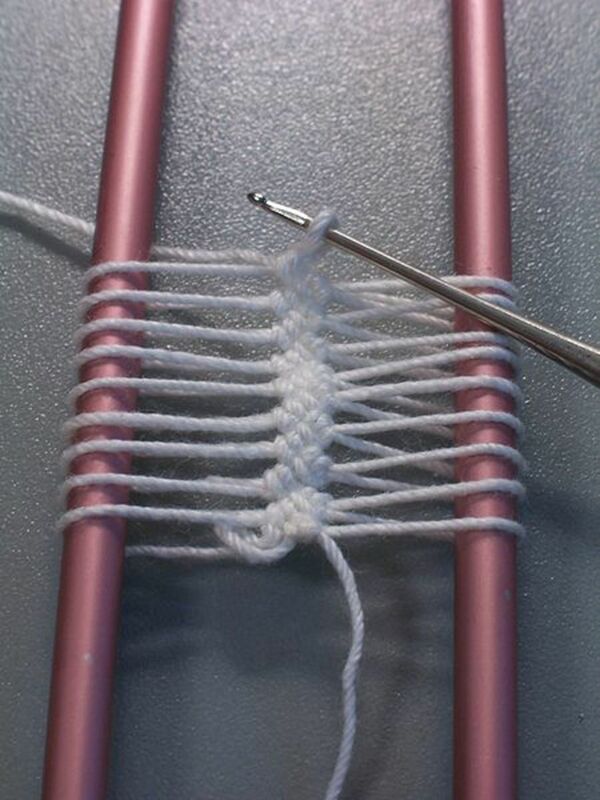 I am a new crazy quilter and would love to see your ten step procedure. I don't know if you have posted your 12 step hub yet, but if you haven't I hope you do soon. 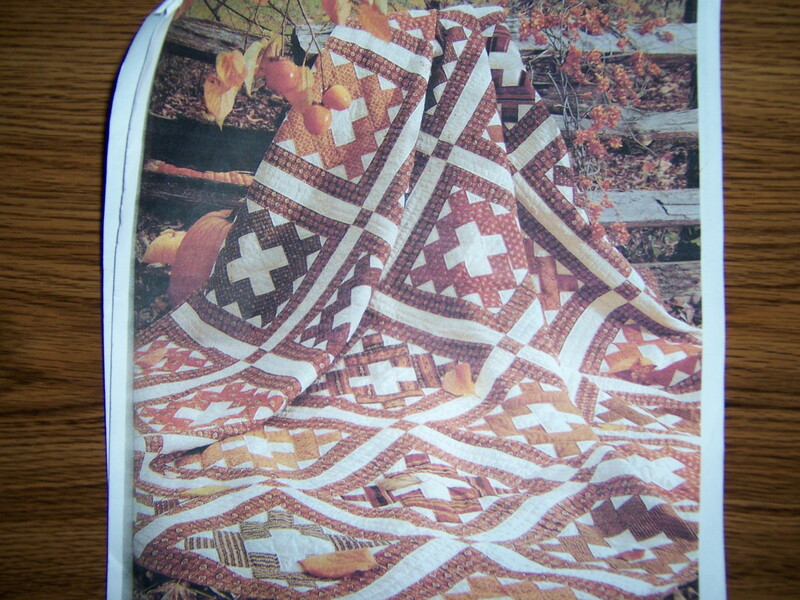 I'm a newbie crazy quilter, newbie quilter even, and love to read and to see pics of others works. 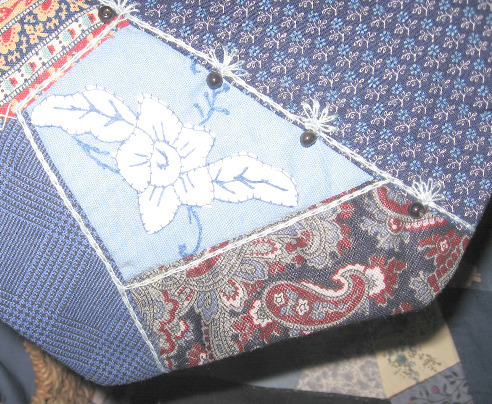 I have a blog with my quilting efforts. It is so much fun.